Pandigital has another new ereader on the loose, this one is called the Pandigital Nova. It is nearly identical to the Pandigital Planet that was also recently introduced, but there are a few subtle differences. For one, the Pandigital Nova comes with 2x more internal memory, 4GB, and it runs Android 2.3 instead of 2.2. The camera is above the upper-right of the screen instead of centered, and the home and back buttons are swapped. Other than that they look like twins and the specs appear to be pretty much the same. 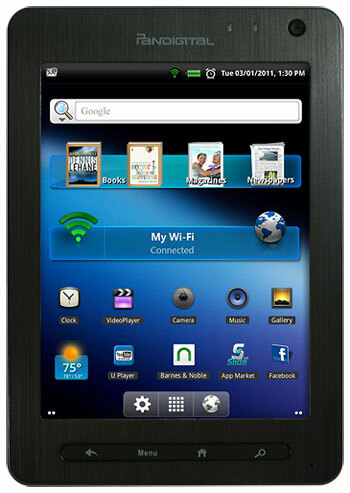 According to the listing at Best Buy, the Pandigital Nova has a 7″ TFT-LCD 800 x 600 screen, front and rear facing cameras, Wi-Fi, 800MHz processor, microSD card slot, mini USB port, and micro HDMI port. It says that it uses an ActiveTouch screen, which is a resistive screen with multi-touch support. Like its predecessors, it comes with the Barnes and Noble Nook software built-in for purchasing and reading ebooks from B&N. It’s also able to install a number of other ereading apps thanks to the open Android 2.3 software. There’s not really any additional information available yet. The Best Buy listing is low on details and the Nova isn’t showing up anywhere else just yet, not even on Pandigital’s own website. But it will no doubt have the same apps as the Pandigital Planet, which means no Android Market access without a hack. It’s not unusual for Pandigital to release a number of devices with minor differences. It makes everything nice and confusing. Recently the Pandigital SuperNova passed through the FCC. It has pretty much the same exact features as the Nova but is supposed to have an 8″ screen. Maybe it’ll show up on some website next week. Did you decide to pass on reviewing the Onyx 9.7″. I don’t really care since I have already ruled out getting one. I am still waiting for the right one; it could be a very long wait. The market for large-screened ebook readers must not be so great, at least the perceived market. Even Amazon hardly puts any effort into the DX. The firmware on it is still like a generation behind the Kindle 3. And we have rumors of two new 6″ Kindles coming out, but no rumors of a DX upgrade. What we need is a 10″ E Ink tablet running Android :). When are you planning to release the final review of the Acer Iconia tablet? How this tablet compares with the Ipad 2 and the motorola zoom.? I have been reading your daily articles and have learn a lot about tablets. I recomende your website to my friends.thank you for taking time to assist and educate us with information about Tablets and ereaders. You have a wonderful website. Hi Yani. Thanks for the kind words. I decided I’m not going to review any more high-end tablets because there are too many of them and they are too expensive. I’m primarily going to stick with ebook readers and budget tablets from now on. From what I’ve read though, the Iconia is a pretty good tablet. I messed with one in the store briefly but it’s so hard to get a feel for it when it’s tethered to a stand. I think the build quality is a little better than the Transformer, not as good as the iPad or Xoom. pandigital-nova-digital-reader looks amazing and with many unique features.Thanks for sharing. Yeah, I’m sure. There’s another post somewhere over there from someone who works for Pandigital saying most people think it is capacitive because it works so well for being resistive and supports multi-touch. I picked one of these up so I’ll post more info soon. It is very hackable. There’s already root and Android Market for it. I’ll post a tutorial soon.